10:47 110 held,20 did not cross it-turning down? 12/12/2003 01:58:24 PM Mountain jcsg:: one more pop after rth close and then drop on Monday? 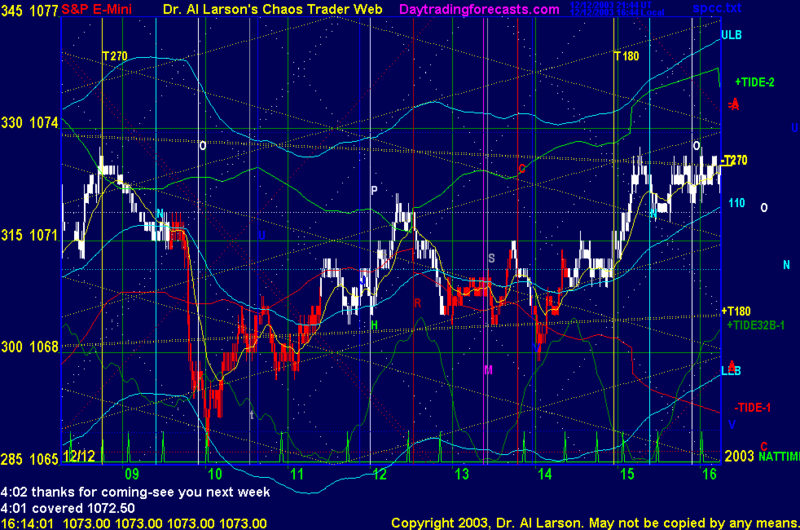 12/12/2003 01:40:36 PM Mountain wlj:: 30 min chart adv decline osc, has said down most of the day . so far sp has powered thru and gone up. 12/12/2003 01:23:37 PM Mountain bkw:: both the dow and spoo cash hit the top of their trendlines and stopped-moment of truth rite now! 12/12/2003 01:15:48 PM Mountain jcsg:: thanks wlj. now the thrust better not die! 12/12/2003 12:35:15 PM Mountain jcsg:: contracting triangle may be forming...could break up to 1078. 12/12/2003 12:07:42 PM Mountain wlj:: moon maybe overhead res now ? 12/12/2003 10:39:22 AM Mountain wlj:: one more up may be 7 swings up. 12/12/2003 10:30:21 AM Mountain wlj:: :45 to :50 after may be moment of truth.